Although Payment Card Industry Data Security Standards (PCI DSS) compliance is the main reason most organizations deploy Web Application Firewalls (WAFs), many now realize that unprotected web applications are the easiest point of entry for even unsophisticated hackers. Externally-facing web applications are vulnerable to attacks such as cross site scripting, SQL injection, and Layer 7 Denial of Service (DoS). Internal web applications are even easier to compromise if an attacker is able to gain access to an internal network where many organizations think they're protected by their perimeter network defenses. Custom code is usually the weakest link as development teams have the impossible task of staying on top of every new attack type. However, even commercial code is vulnerable as many organizations don't have the resources to apply patches and security fixes as soon as they're made available. Even if you apply every patch and have an army of developers to protect your systems, zero-day attacks can leave you defenseless and only able to respond after the attack has occurred. Using an advanced multi-layered and correlated approach, FortiWeb provides complete security for your external and internal web-based applications from the OWASP Top 10 and many other threats. Using IP Reputation services, botnets and other malicious sources are automatically screened out before they can do any damage. DoS detection and prevention keeps your applications safe from being overloaded by Layer 7 DoS attacks. FortiWeb checks that the request hasn't been manipulated using HTTP RFC validation. Requests are checked against FortiWeb's signatures to compare them against known attack types to make sure they're clean. Any files, attachments or code are scrubbed with FortiWeb's built-in antivirus and antimalware services. FortiWeb's auto-learning behavioral detection engine reviews all requests that have passed the tests for known attacks. If the request is outside of user or automatic parameters, the request is blocked. Lastly, FortiWeb provides a correlation engine where multiple events from different security layers are correlated to make a more accurate decision and help protect against the most sophisticated attacks. This combination provides near-100% protection from any web application attack, including zero-day threats that signature file-based systems can't detect. Only FortiWeb includes a web application vulnerability scanner in every appliance at no extra cost to help you meet PCI DSS compliance. FortiWeb's vulnerability scanning dives deep into all application elements and provides in-depth results of potential weaknesses in your applications. Vulnerability scanning is always up-to-date with regular updates from FortiGuard Labs. As the threat landscape evolves, many new threats require a multi-pronged approach for protecting web-based applications. Advanced Persistent Threats that target users can take many different forms than traditional single-vector attack types and can evade protections offered only by a single device. FortiWeb's integration with FortiGate and FortiSandbox extend basic WAF protections through synchronization and sharing of threat information to both deeply scan suspicious files and share infected internal sources. FortiWeb is one of many Fortinet products that provides integration with our FortiSandbox advanced threat detection platform. FortiWeb can be configured with FortiSandbox to share threat information and block threats as they're discovered in the sandboxing environment. Files uploaded to web servers can be sent to FortiSandbox for analysis. Alerts are sent immediately when malicious files are identified and future similar files are blocked immediately. Integration with FortiGate enables the sharing of quarantined IP addresses detected and maintained on the FortiGate firewall. 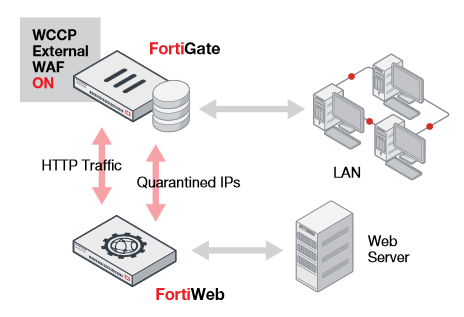 Through regular polling of the FortiGate, FortiWeb is up-to-date with the latest list of internal sources that have or are suspected of being infected and blocks traffic from these devices from doing more damage. Additionally, FortiGate users can now simplify the deployment of FortiWeb in a Fortinet-based network. Using the WCCP protocol, a FortiGate can be configured to direct HTTP traffic for inspection to a FortiWeb without having to manually configure routers or DNS services. Users can set up custom rules to route specific traffic using comprehensive granular forwarding policies. FortiWeb seamlessly integrates with FortiGate to pass HTTP traffic for inspection and shares Quarantined IP information. False positive detections can be very disruptive if a web application firewall isn't configured correctly. Although the installation of a WAF may only take minutes, fine tuning it to minimize false positives can take days or even weeks, plus there's the regular ongoing adjustments for application and environment changes. FortiWeb combats this problem with many sophisticated tools including alert tuning, white lists, automatic learning exceptions, correlated threat detection, and advanced code-based syntax analysis. FortiWeb is the only WAF that employs User Scoring and Session Tracking to further enhance our False Positive Mitigation tools. Administrators can attach threat levels to any of FortiWeb's WAF protections then set trigger thresholds that can block, report or monitor users that cross a combined multi-event violation score over the lifetime of their session. Never before has this level of customization and advanced correlation been available in a WAF and it can dramatically reduce the number of falso positive detections depending on the level of sensitivity set by the administrator. 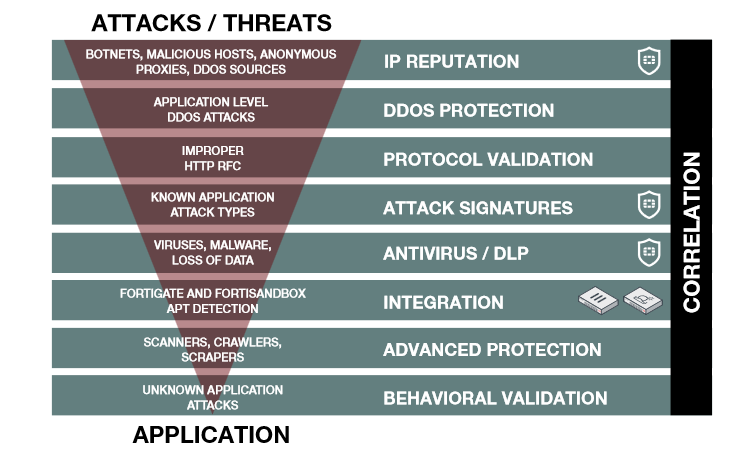 Fortinet's Award-winning FortiGuard Labs is the backbone for many of FortiWeb's layers in its approach to application security. Offered as 3 separate options, you can choose the FortiGuard services you need to protect your web applications. FortiWeb IP Reputation service protects you from known attack sources like botnets, spammers, anonymous proxies, and sources known to be infected with malicious software. FortiWeb Security Service is designed just for FortiWeb including items such as application layer signatures, malicious robots, suspicious URL patterns and web vulnerability scanner updates. Finally, FortiWeb offers FortiGuard's top-rated antivirus engine that scans all file uploads for threats that can infect your servers or other network elements. FortiWeb provides integration with leading third-party vulnerability scanners including Acunetix, HP WebInspect, IBM AppScan and WhiteHat to provide dynamic virtual patches to security issues in application environments. Vulnerabilities found by the scanner are quickly and automatically turned into security rules by FortiWeb to protect the application until developers can address them in the application code. FortiWeb is able to process up to tens of thousands of web transactions by providing hardware accelerated SSL offloading in most models. With near real-time decryption and encryption using ASIC-based chipsets, FortiWeb can easily detect threats that target secure applications. FortiWeb provides advanced Layer 7 load balancing and authentication offload services. FortiWeb can easily expand your applications across multiple servers using intelligent, applicationaware Layer 7 load balancing and can be combined with SSL offloading for load balancing secure application traffic. Using HTTP compression, FortiWeb can also improve bandwidth utilization and user response times for content-rich applications. Authentication offloading integrates with many authentication services including LDAP, NTLM, Kerberos and RADIUS with 2-factor authentication for RADIUS and RSA SecureID. Using these authentication services, you can easily publish websites and use Single Sign On (SSO) for any web application including Microsoft applications such as Outlook Web Access and SharePoint. Finally, FortiWeb can improve application response times by caching often-used content to serve it to users faster than having to request the same information each time it is needed. FortiWeb provides maximum flexibility in supporting your virtual and hybrid environments. The virtual versions of FortiWeb support all the same features as our hardware-based devices and work with all the top hypervisors including VMware, Microsoft Hyper-V, Citrix XenServer, Open Source Xen and KVM. FortiWeb is also available for Amazon Web Services and Microsoft Azure. All performance values are “up to” and vary depending on the system configuration. Actual performance values may vary depending on the network traffic and system configuration. Performance metrics were observed using a Dell PowerEdge R710 server (2x Intel Xeon E5504 2.0 GHz 4 MB Cache) running VMware ESXi 5.5 with 4 GB of vRAM assigned to the 4 vCPU and 8 vCPU FortiWeb Virtual Appliance and 4 GB of vRAM assigned to the 2 vCPU FortiWeb Virtual Appliance. Download the Fortinet FortiWeb Series Datasheet (PDF).